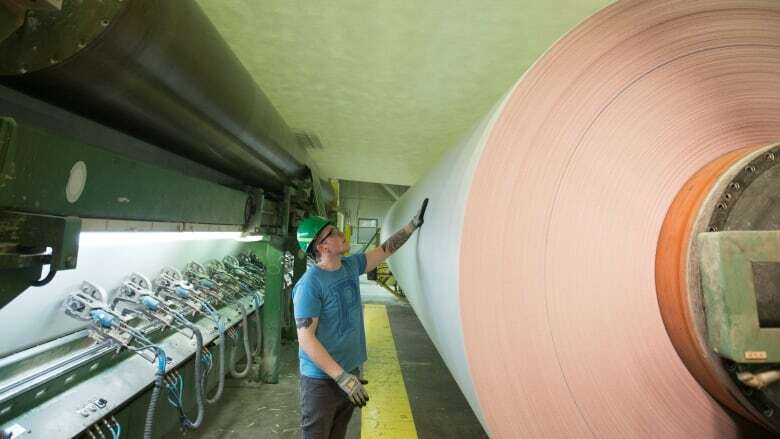 The U.S. International Trade Commission has overturned duties imposed on Canadian newsprint after finding that imports of the paper product, part of the wider category of uncoated groundwood paper, do not hurt U.S. industry. The U.S. International Trade Commission has overturned duties imposed on Canadian newsprint by the U.S. Commerce Department earlier this year. The five commissioners voted unanimously Wednesday that imports from Canada of uncoated groundwood paper, used for newspapers, commercial printing and book publishing, do not injure the U.S. industry. The U.S. Commerce Department had imposed anti-dumping and countervailing duties of various levels on Canadian producers including Resolute Forest Products, Catalyst Paper Corp., Kruger Inc., and White Birch Paper. The U.S. International Trade Commission's vote overrules the findings of the Commerce Department. The vote was welcome news to Montreal-based Resolute, the largest newsprint producer in the world. "To get a five to zero, unanimous vote finding no injury is just a monumental victory for our efforts," said company spokesperson Seth Kursman. "I am just thrilled .. .it is a great day for the American consumer, it is a great day for freedom of the press." The vote comes after U.S. newspapers had campaigned to lift the duties that had pushed a core expense higher and forced layoffs at some papers. The U.S. imported an estimated $1.21 billion US worth of uncoated groundwood paper last year. David Chavern, CEO of U.S. newspaper industry group News Media Alliance, applauded the ruling. "The tariffs would have been unsustainable for newspapers, other printers and publishers and printers. Fortunately, our voice was heard at the ITC hearing last month, and they made the right call today in reversing these harmful tariffs," Chavern said in a statement. He said the group had emphasized in recent months that it was a decades-long shift from print to digital platforms that is causing a decline in newsprint demand, not imports from Canada. The duties had come about after Washington-based North Pacific Paper Co., owned by hedge fund One Rock Capital Partners LLC, complained Canada was dumping newsprint into the U.S. market and unfairly subsidizing its industry. Craig Anneberg, CEO of North Pacific, said in a statement that the company disagrees with the ruling and it will assess its options when the detailed written determination is released in a few weeks. "We are very disappointed in the USITC's negative determination, given that the record clearly shows that the domestic industry has been materially injured by dumped and subsidized imports from Canada." The company's argument is the same made regarding Canada's softwood industry, which led to the imposition of both countervailing and anti-dumping duties on most Canadian softwood exports to the United States. Kursman said the reversal of the duties means Resolute will have millions of dollars in deposits returned, and avoid tens of millions of dollars in future payments. He said the campaign to end the duties was supported by 174 members of Congress and forestry industry groups in the U.S. The end of uncoated groundwood duties follows the reversal in July of duties the U.S. had imposed on supercalendered paper from Canada in 2015. In January, the U.S. International Trade Commission reversed nearly 300 per cent duties imposed on Bombardier's C Series aircraft after a complaint by rival Boeing. The tariffs had helped prompt Bombardier to sell the aircraft to Airbus, which renamed it the A220.